Remove occasional offshoots to keep plant’s solitary form. Excellent giant landscape agave with few to no offshoots. 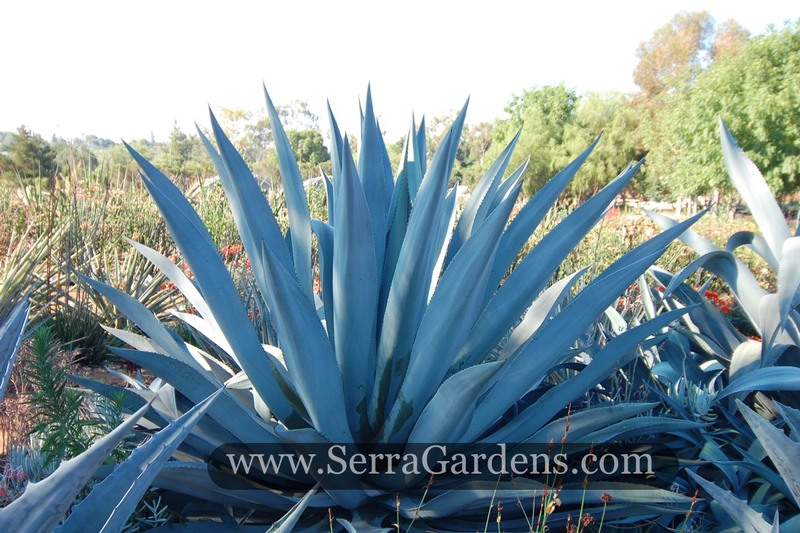 This is a dramatic large specimen plant, xeriscape, good in large rock gardens, succulent and cactus gardens. This is a well armored, spiny plant so plan for its mature size and keep plant well clear of pedestrian traffic. It is generally not appropriate for small residential landscapes because of its size and the difficulty of removing a mature specimen once it flowers and dies. However, as a dramatic large container planted in a pot it will remain a more manageable size. Agave franzosinii is a very large, attractive agave with a generally solitary rosette. It has powdery bluish-gray large leaves that undulate and bend gracefully. There are large teeth along the leaf margins and a sharp terminal spine. This plant is monocarpic and blooms after 15 – 20 years of growth. Like most agaves the flower stalks resembles a giant asparagus spear. As this grows it branches with panicles of yellow or greenish-yellow flowers at the ends of each branch. The stalks can reach 40 feet tall and are a focal point in the garden while they bloom. The original plants of this species were collected from Mexico in the 19th century and taken to Italy. Its Latin name is taken from the villa where it became established. No record exists of a natural distribution of Agave franzosinii. Whether it is an unusual form of Agave americana, with which it appears closely related, or a one-time hybrid has yet to be determined.